You can also contact us by Telephone or Fax. Please make sure that you have dial the right number. Our representative help to resoled your query. Malad (West) Mumbai - 400 064, INDIA. 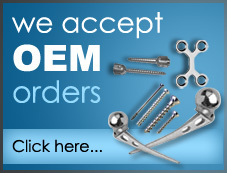 Orthopedic-Implants.net is one of the leading orthopedic implant manufacturers and suppliers in India. We are also exporter of orthopaedic implants and surgical instrument set like bone implant, ortho plates and screws, drill set, medical equipments and instrument set, etc from mumbai, India.